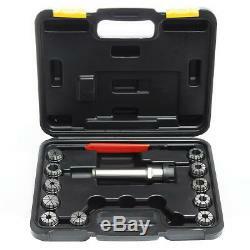 11pcs ER32 Collet Chuck Set With MT4 Shank Chuck And Spanner For Milling Machine. Main Material: Alloy Spring Steel. ER32 Collet Set: 1/8, 3/16, 1/4, 5/16, 3/8, 7/16,1/2, 9/16, 5/8, 11/16, 3/4. ER32 collet chuck Size: 5 x 14cm(D x H) Draw bar threads 1/2 x 13. ER32 collet chuck Handle diameter: 20.7mm/ 0.8'. ER32 Spanner Length: 20.5cm. Box Sizes: 340 x 270 x 90mm. All Collets are Made of high quality alloy spring steel 0.0005 accuracy. 11pcs ER32 Collet Set : 1/8 - 3/4 (1/8, 3/16, 1/4, 5/16, 3/8,7/16,1/2, 9/16, 5/8, 11/16, 3/4). 1pc x MT4 Shank ER32 collet chuck. 11pcs x ER32 Collet Set. Please allow a bit error due to manual measurement. The color may have different as the difference display, pls understand. The item "11pcs ER32 Collet Chuck Set With MT4 Shank Chuck And Spanner For Milling Machine" is in sale since Monday, March 12, 2018. This item is in the category "Equipamiento y maquinaria\Equipamiento industrial".